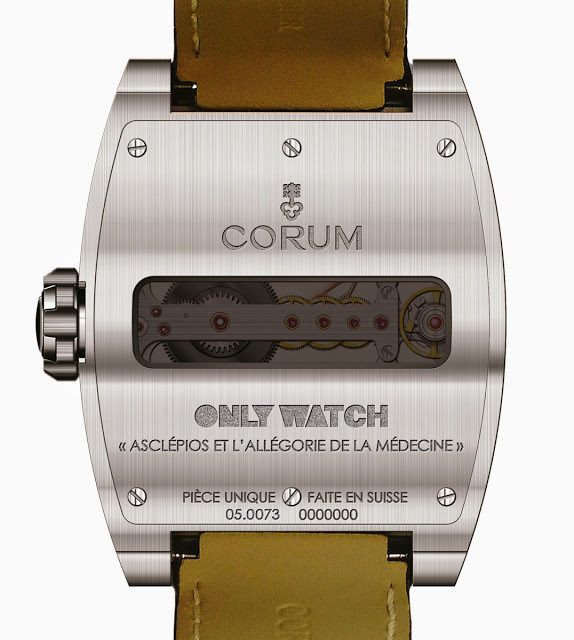 Corum has created a unique version of the Ti-Bridge for Only Watch 2013. 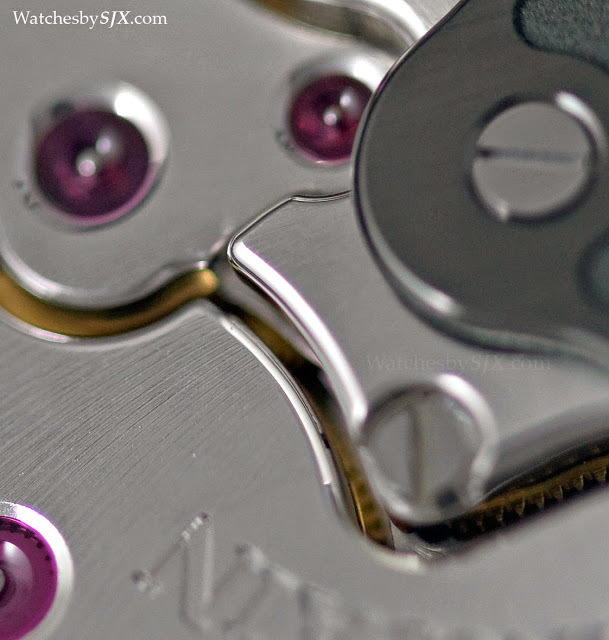 Each side of the case features red gold inserts engraved with a motif reflecting the theme of Only Watch. 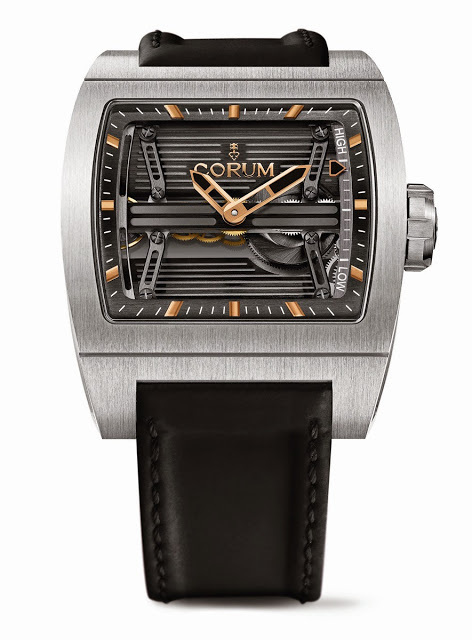 Amongst the watches in the upcoming Only Watch charity auction will be a unique Corum Ti-Bridge 3-Day Power Reserve. 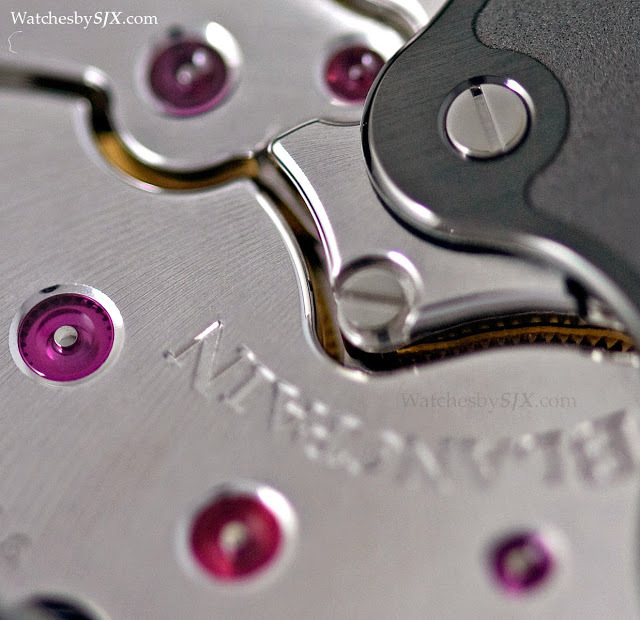 The key feature which distinguishes this from the regular model is are the hand-decorated red gold inserts screwed into each flank of the case. 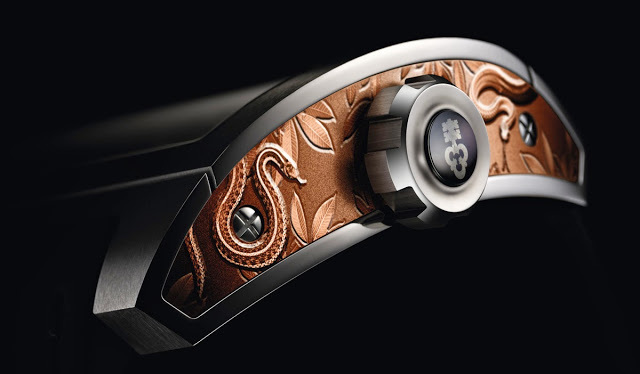 Both inserts are hand-engraved with an allegory depicting snakes and Asclepius, the Greek god of medicine, set against a frosted background with leaves. 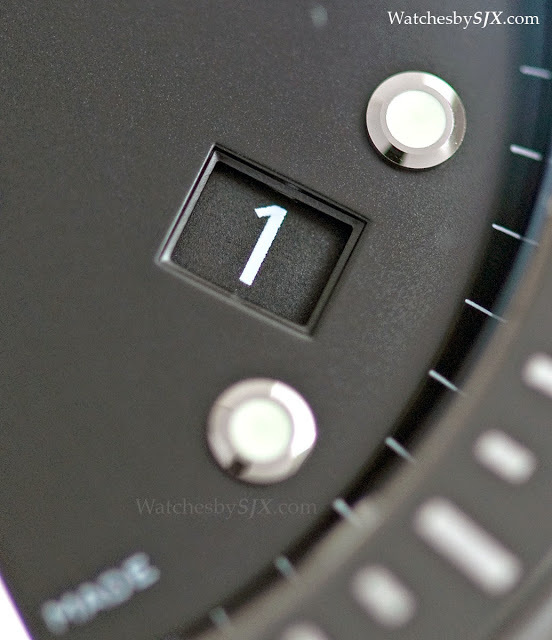 The motif is a nod to the goal of Only Watch, which is to raise funds for research into Duchenne muscular dystrophy. 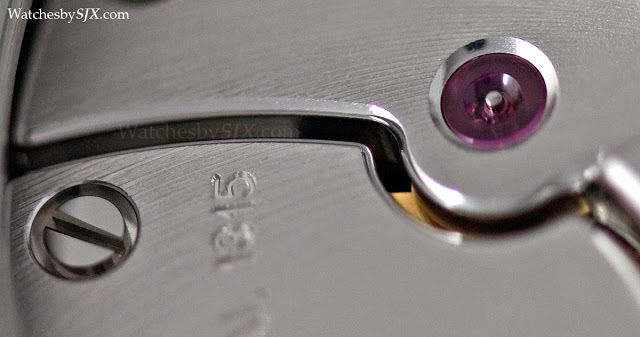 Another unique feature of this Ti-Bridge are the hands, markers and power reserve arrow, which are plated in red gold. 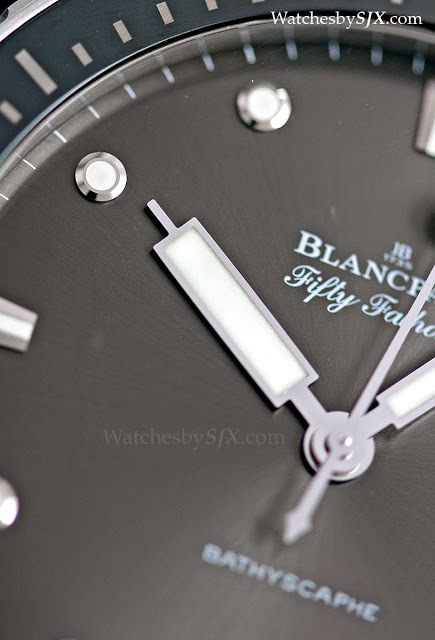 These provide a strong contrast with the dark grey dial, which frames the horizontal movement secured by four struts. 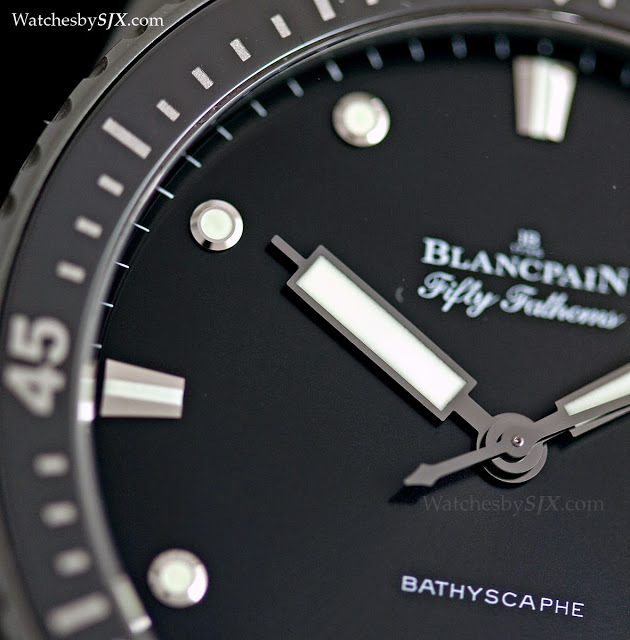 Sold alongside the Fifty Fathoms in the fifties for around a decade, the Bathyscaphe was the Fifty Fathom’s smaller brother, literally, with a smaller size case. 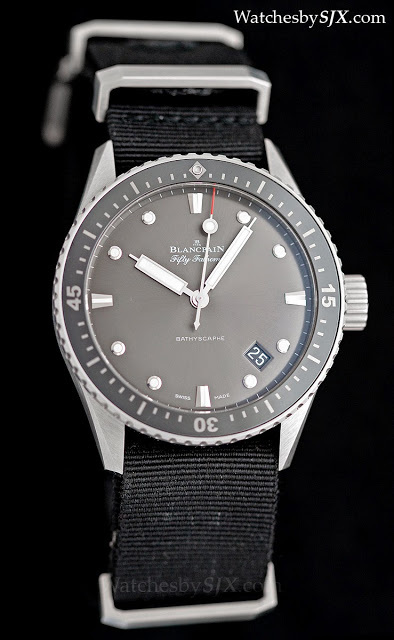 Today that distinction remains, with the newly introduced Bathyscaphe being smaller in diameter, and also more accessibly priced. 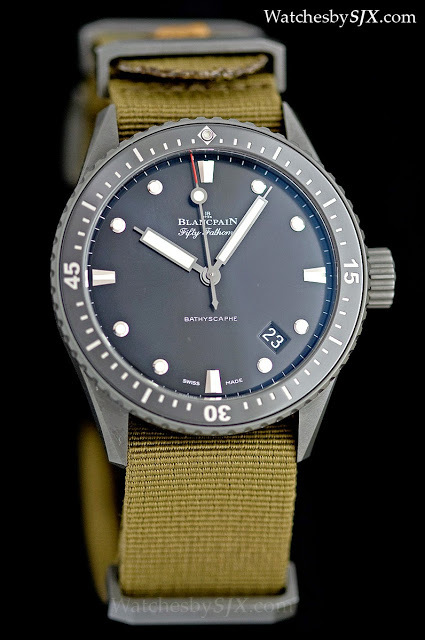 The Bathyscaphe has a 43 mm case (the Fifty Fathoms is 45 mm and far chunkier), with a thinner, more angular case, giving it a fairly vintage vibe. 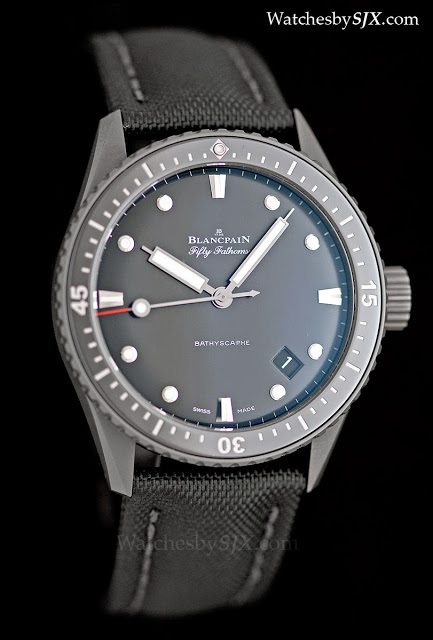 Two versions are available, one in brushed steel with a sunburst grey dial, and the other in black ceramic coated titanium with a glossy black dial. 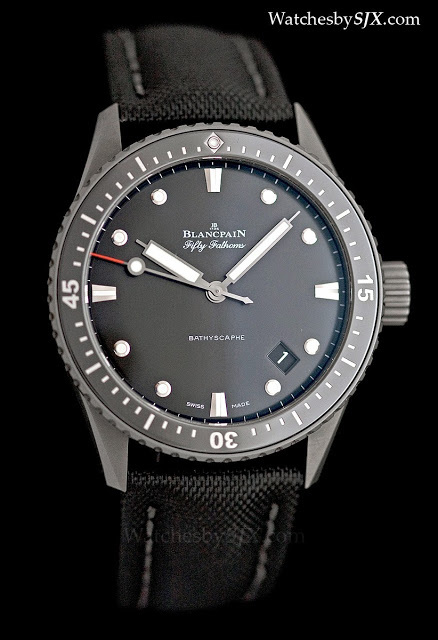 Both types have a ceramic bezel insert in a colour matching the dial, and are each available on either nylon or NATO-style straps. 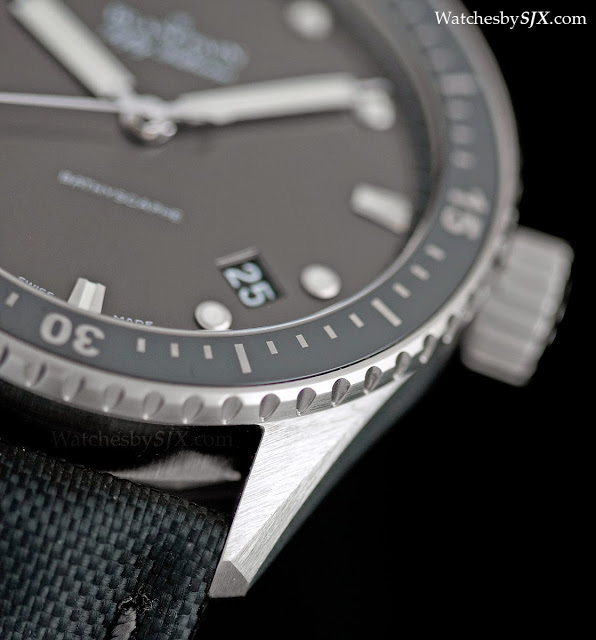 Despite being identical, each variant looks very differently. 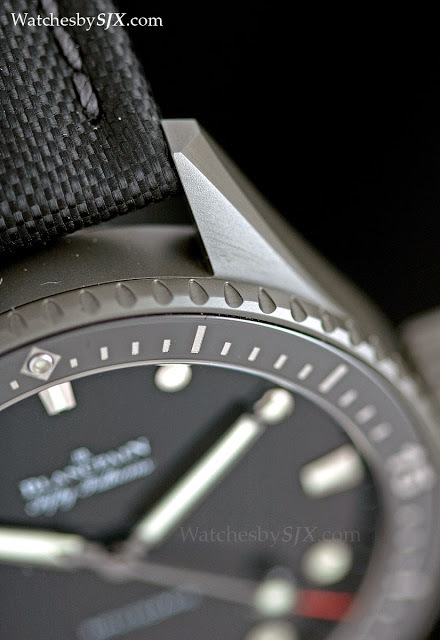 The titanium version looks much more modern, while the steel version with grey dial is reminiscent of a vintage watch. 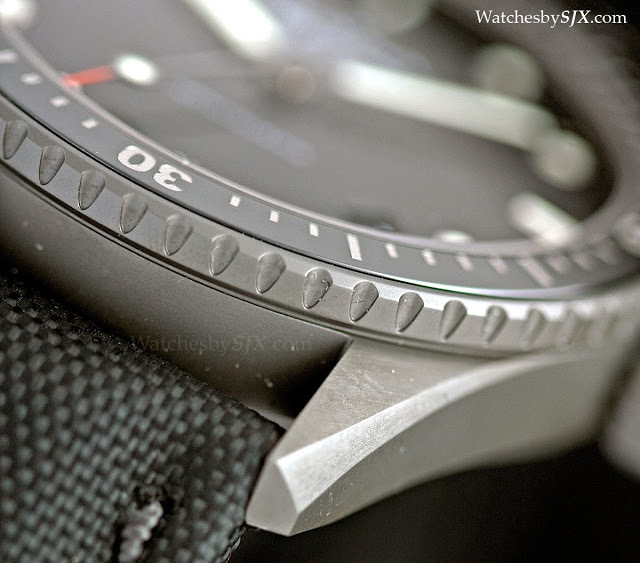 The titanium version has a deep, glossy back dial with a fine grained surface that is not apparent except under magnification. 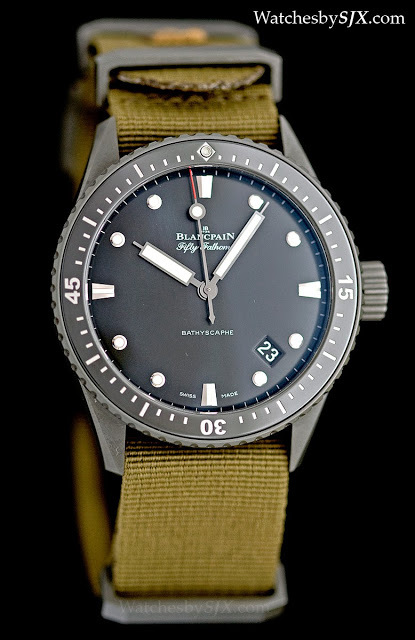 Being black on black, with a red-tipped seconds hand, the titanium Bathyscaphe is striking, but the resulting look is somewhat generic. 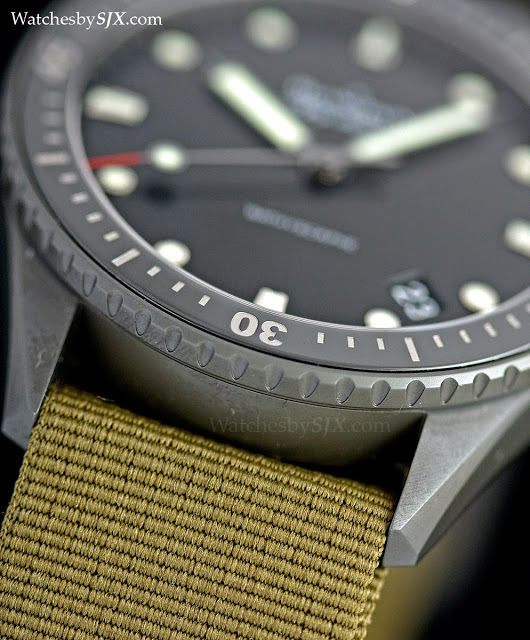 That being said, the titanium Bathyscaphe on an olive green NATO strap is a winner, and probably my favourite of the lot. 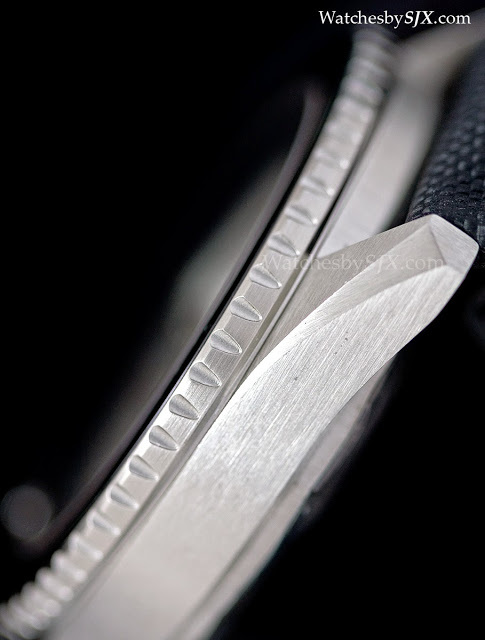 Coated with a thin layer of ceramic that reveals the brushed surface beneath, the titanium case is well made, with precise angles and lines. 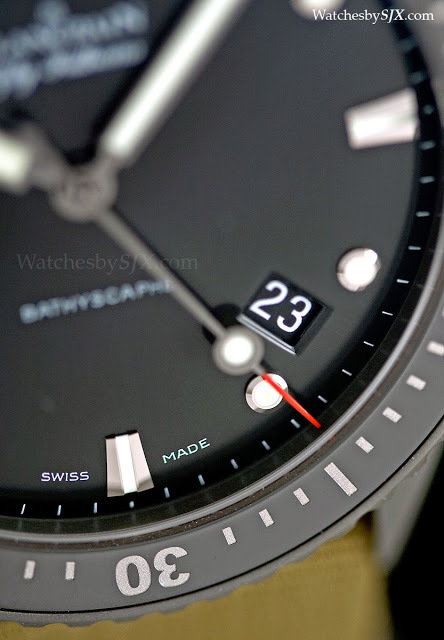 The notches on the bezel are a good example of the precision of the case work. 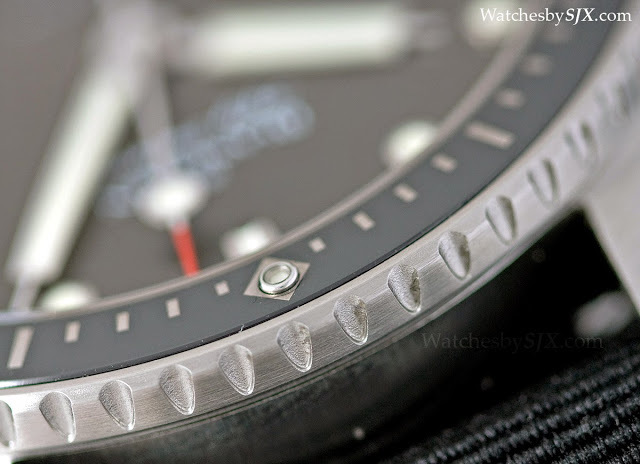 Oddly enough the steel case is not as well done – the brushing appears less refined, and the notches in the bezel are not as sharply defined. 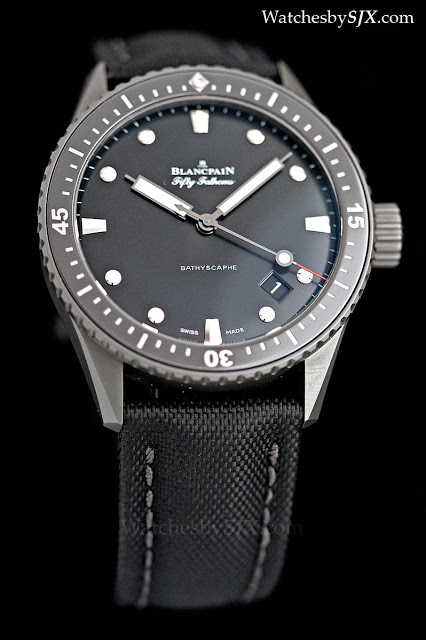 Perhaps the difference is due to both of these being pre-production prototypes. 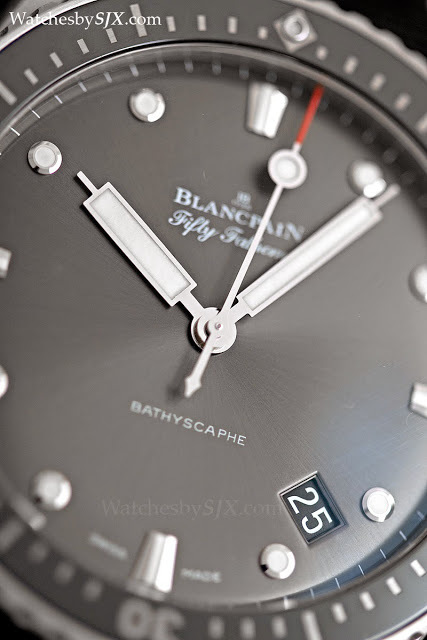 Though the steel version is not as striking initially, the subtle colour and finish of the grey dial is compelling. 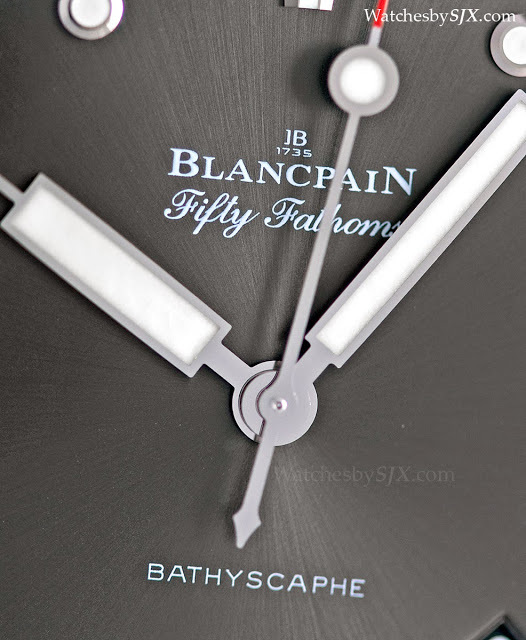 The overall effect is a reassuring vintage feel. 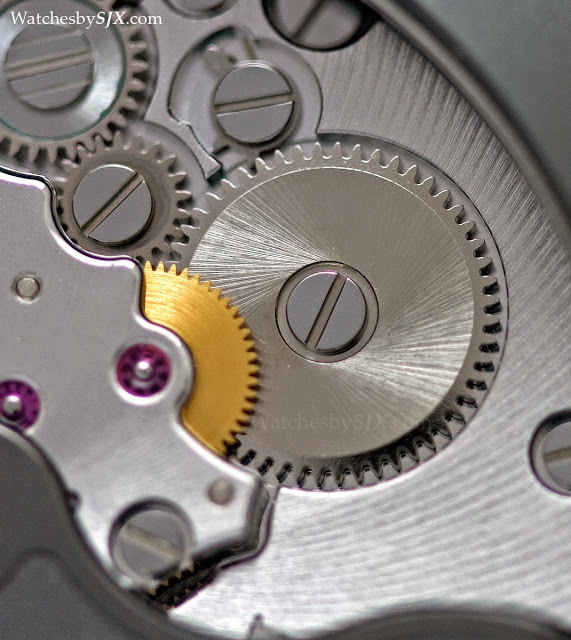 Both versions have use the same cal. 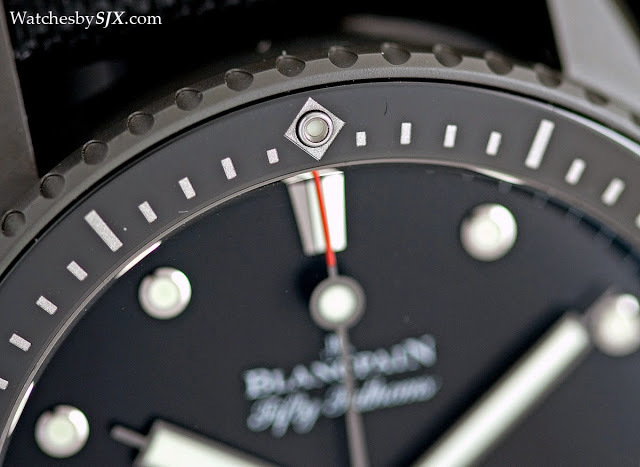 1315 movement, which is also found in the pricier Fifty Fathoms. The cal. 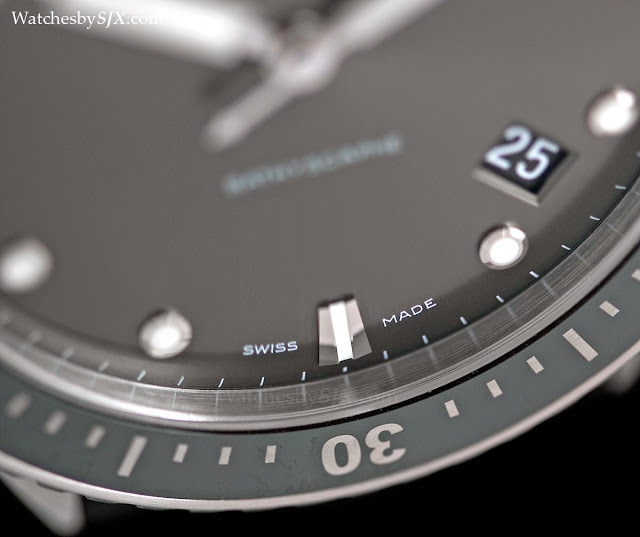 1315 is a large, self-winding movement with three barrels and a five day power reserve. 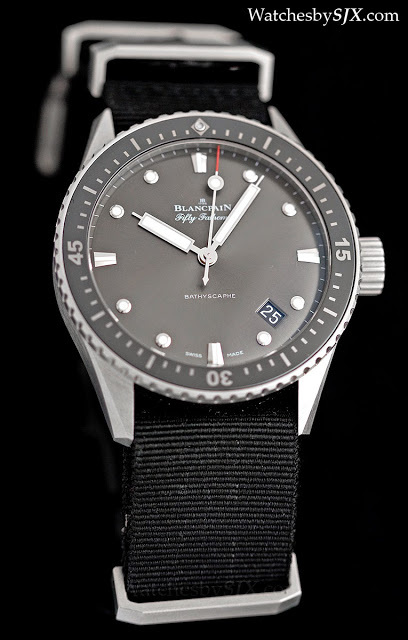 Made in-house by Blancpain, it has a free-sprung balance with adjustable gold screws and a silicon hairspring. 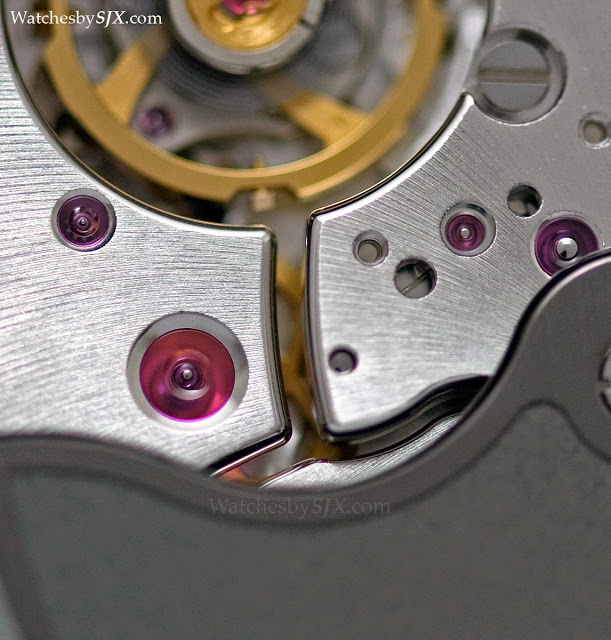 And the rotor is PVD coated 18k gold. 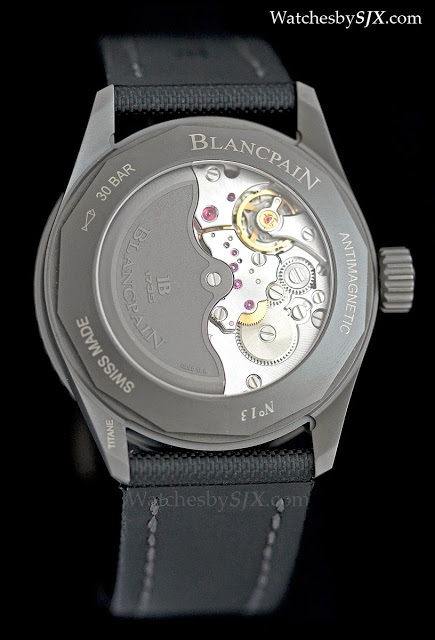 The movement has several details characteristic of Blancpain’s in-house movements: a small balance wheel relative to the movement size, a longish power reserve and prominent jewels on closely spaced bridges. 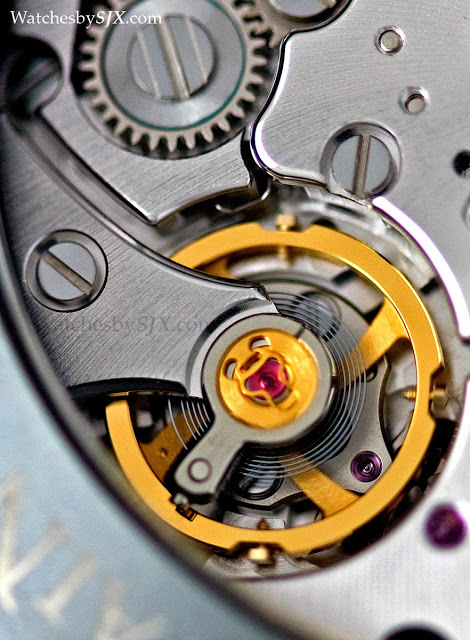 Though the movement finish appears simple at first, upon close inspection the decoration is revealed to be excellent. 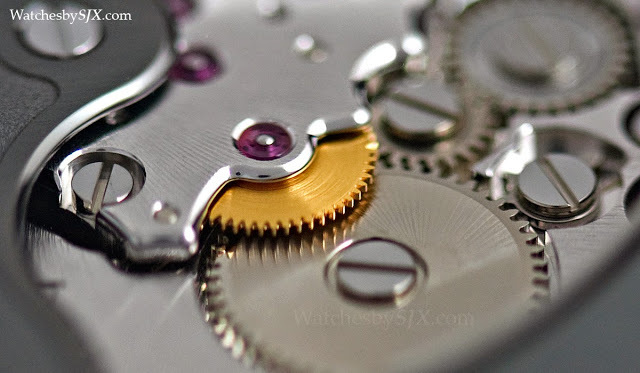 The bridges have a clean, straight grained finish, but the bevelling of the bridges, especially that of the automatic winding bridge, is obvious and attractive. 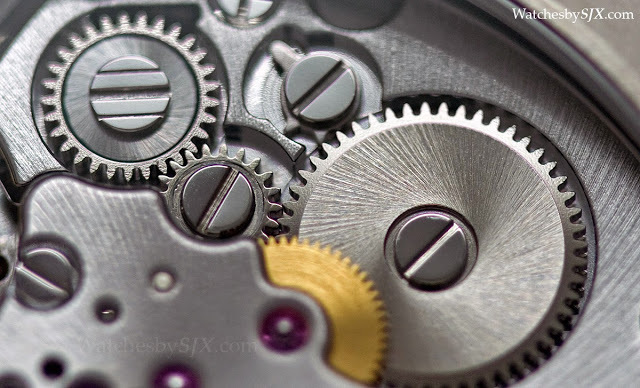 One obvious shortcoming in the generally high level of finish is are the transfer and ratchet wheels for the barrel. 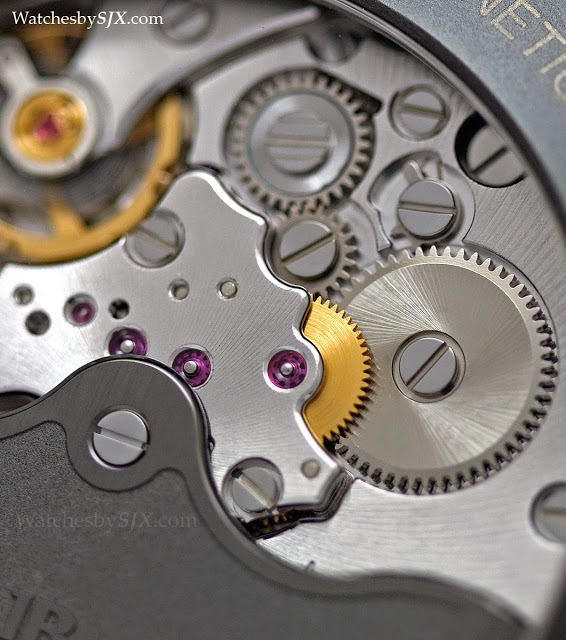 Whether this is a symptom of the watches being prototypes will be easily determined when the production pieces are delivered later this year. 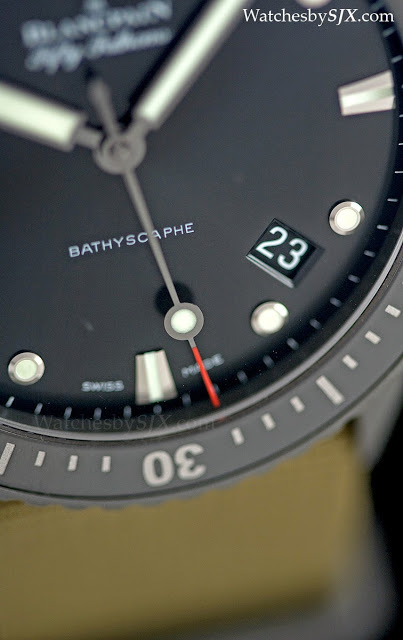 Retailing for US$10,500 in steel and US$12,000 in titanium, and S$14,500 and S$16,600 respectively in Singapore, the Bathyscaphe is significantly more affordable than the Fifty Fathoms, which is fairly expensive in my opinion. 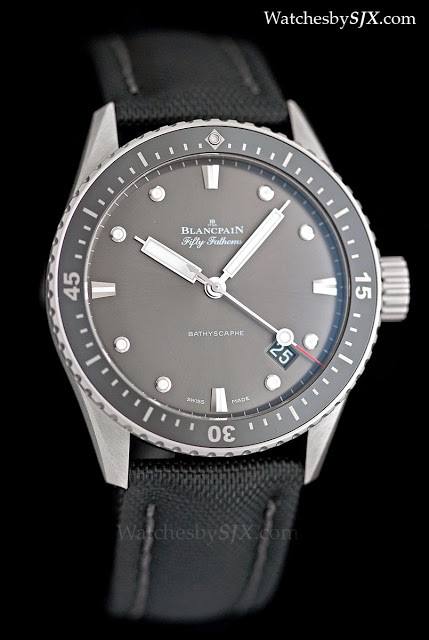 The difference between this and the steel Fifty Fathoms is about a quarter less for the steel Bathyscaphe, and a fifth for the titanium. 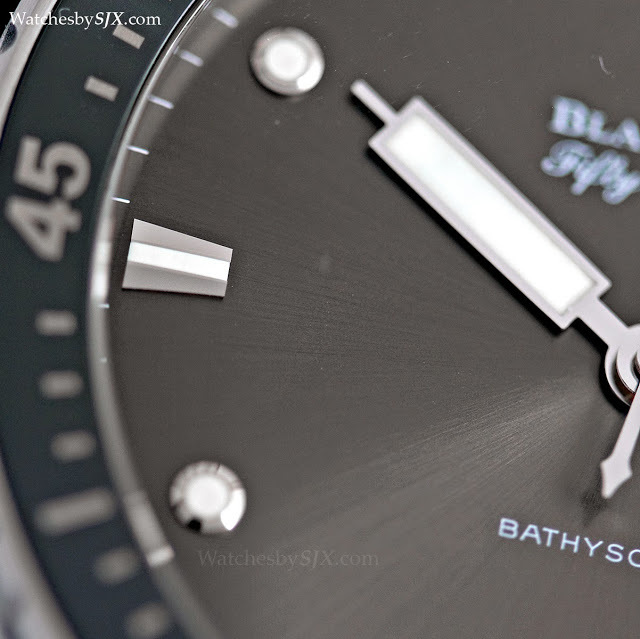 While not inexpensive, the Bathyscaphe is certainly more compelling.